A number of sayings hve their roots in the mouth of a horse. Something is said to be from the highest authority if it comes “straight from the horse’s mouth”. Older individuals are a bit “long in the tooth”. The act of questioning the value of a gift is “looking a gift horse in the mouth”. Puns aside, there is an important discussion to have about the horse’s mouth, and the examination of it. Regular dental maintenance should be an integral part of your horses’ health care regimen. Young or old, every horse should receive a regular dental examination, which can occur without actually working on the teeth, i.e. floating. 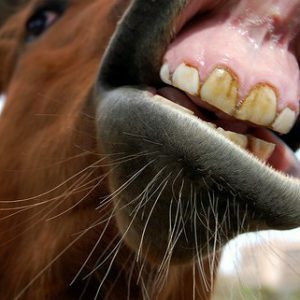 With hypsodont teeth (continuously erupting), a horse’s mouth needs to be monitored for irregularities such as lost or broken teeth, as well as abnormal conformation. Changes or abnormalities that occur as a youngster can be amplified over the years if they are not tended to, causing significant issues as an adult or geriatric. Most horses should have their first full dental exam around age 2 or 3. By this time, many horses are starting into training, and will be wearing a bit for the first time. These youngsters are also quickly shedding their caps (losing baby teeth) and have a drastically changing mouth. With so many teeth coming and going (incisors and cheek teeth), any of these steps can become problematic. 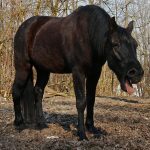 What does an equine oral exam look like? cavity- occlusion (the “bite” of the horse), periodontal tissue, crown of the tooth, and other soft tissue. During the exam, it has historically been challenging for the veterinarian to effectively show clients exactly what is going on, but this hurdle is being overcome with technology. There is an increasing use of scopes and digital camera devices within the oral cavity that can then be “shared” and explained in better detail. 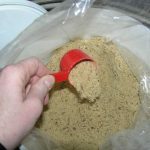 Not only does this allow the horse owner to understand the issues at hand, it allows the veterinarian a more complete visualization of the mouth. The final aspect of a completely comprehensive dental exam would be radiographs (x-rays). Without radiographs we only see a small portion of the tooth exposed in the mouth, and there is so much more below the surface. In fact, some diseases such as EOTRH must be radiographed to characterize the progression and extent of the process. Radiographs of the equine skull can be very difficult to interpret, even for an experienced veterinarian as traditionally, when taking radiographs of the cheek teeth, there is an overlap of both sides of the head, creating a “double image” of the teeth and their roots. But technology is beginning to advance our abilities to attain better images of the horse’s teeth. Equine intraoral radiographic plates are now in use and improving our diagnostic capabilities stall side. Just like the images your dentist takes, radiographs with intraoral plates eliminate the overlapping issue making dental disease diagnosis in the a little bit more straightforward. 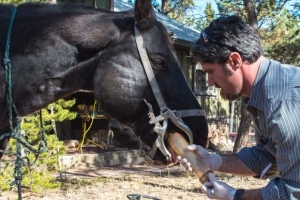 Equine dentistry continues to improve and advance. A complete and thorough age-appropriate examination is the first step to help us to quickly identify issues and correct or mitigate the problems they might cause in the future.